Redfish are getting better everyday with our weather warming up. fishing for Cobia is going into high gear in about 2 to 3 weeks. 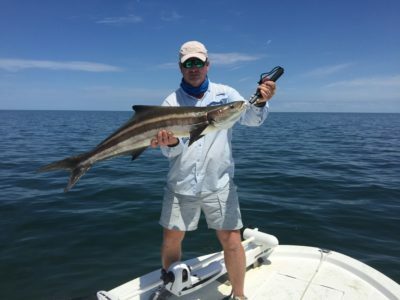 DON’T MISS OUT on catching a cobia this season. Peak season is May and June. We still catch plenty of them during the summer July and August. It was our first time Red fishing and he was so awesome! Fishing with Captain Glen was the best part of the entire trip! Thank you again for such an amazing trip!!!! If you’re looking to charter a Florida flats fishing guide, I hope to hear from you soon. I’m a Native Floridian, and have been fishing the Homosassa, Crystal River, and Ozello area all of my life. Please call for full rate and reservation information. Reservations should be made in advance if possible. Some reservations may require a deposit. What types of fish will we catch? I accept cash, credit cards and personal checks. ©2019 SouthernFishingGuide.net. All rights reserved. Designed and Developed by TrueVision360.